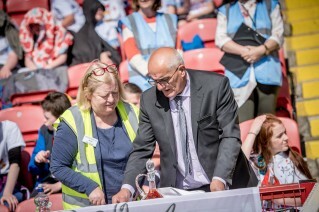 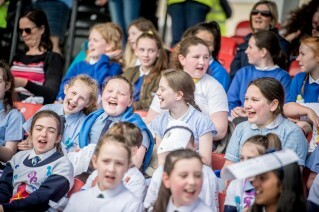 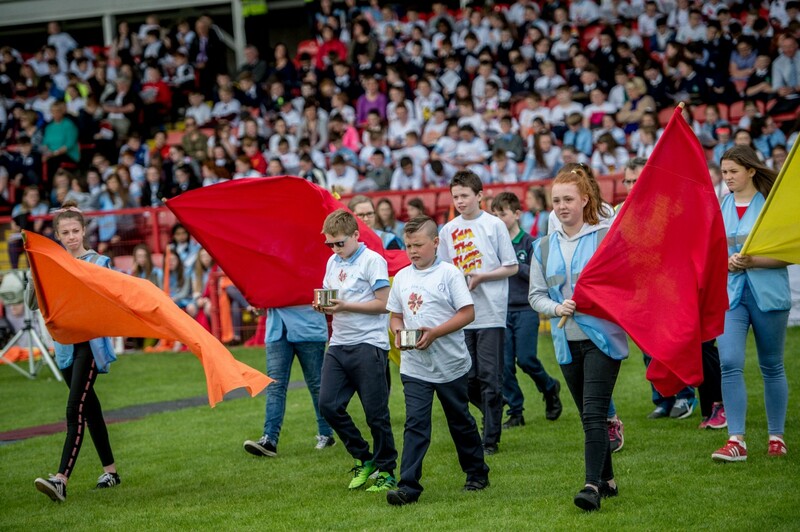 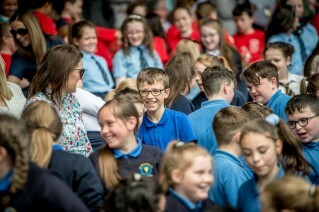 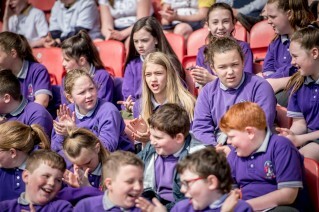 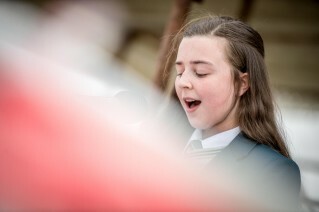 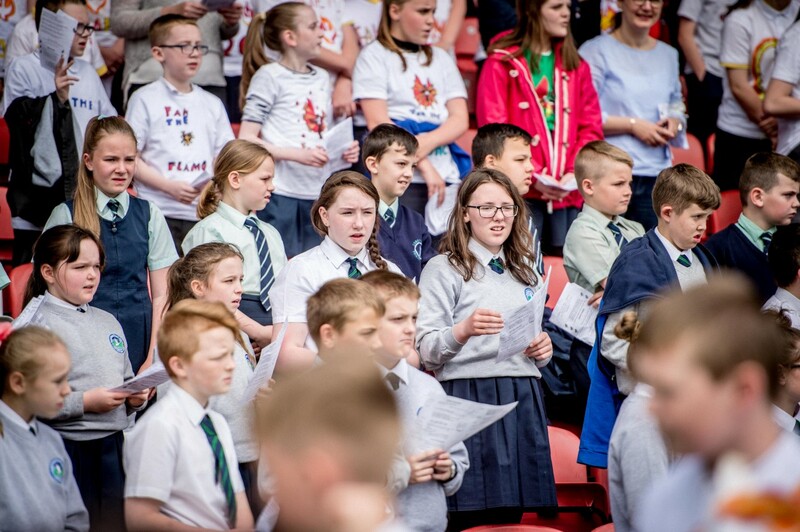 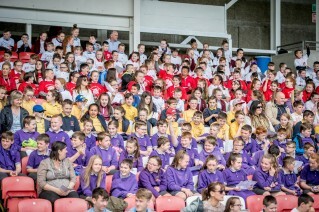 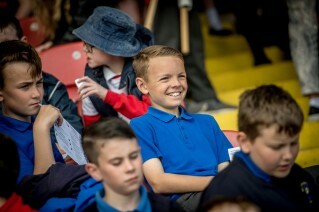 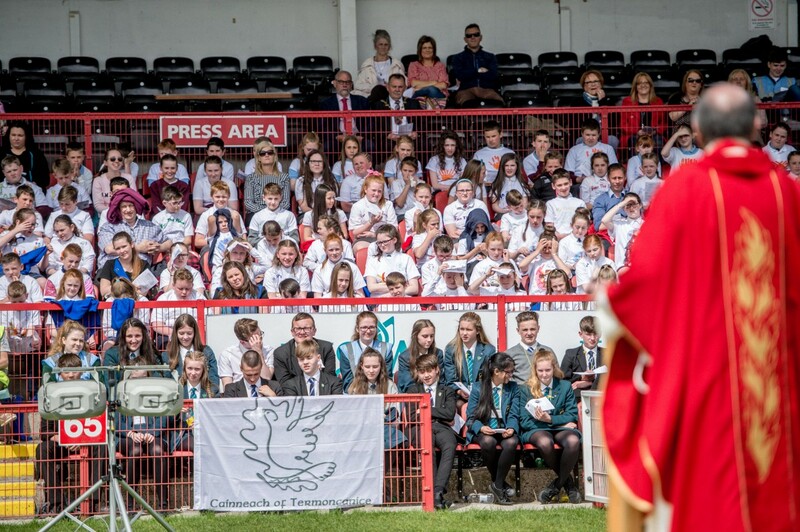 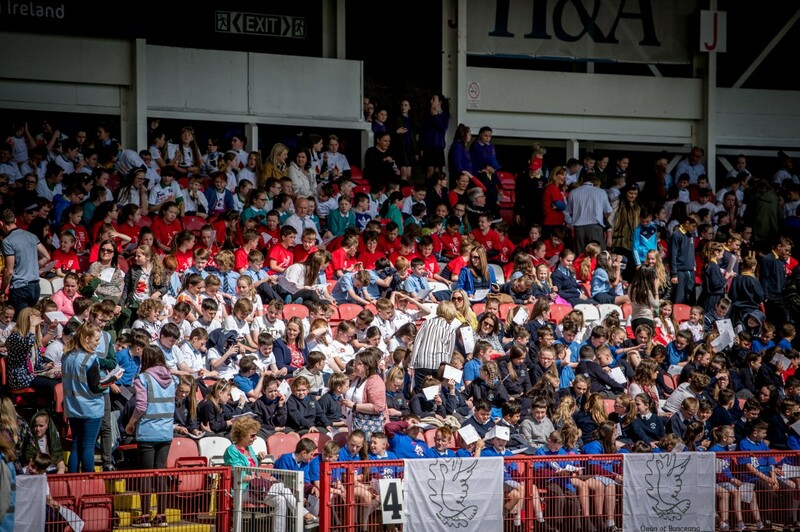 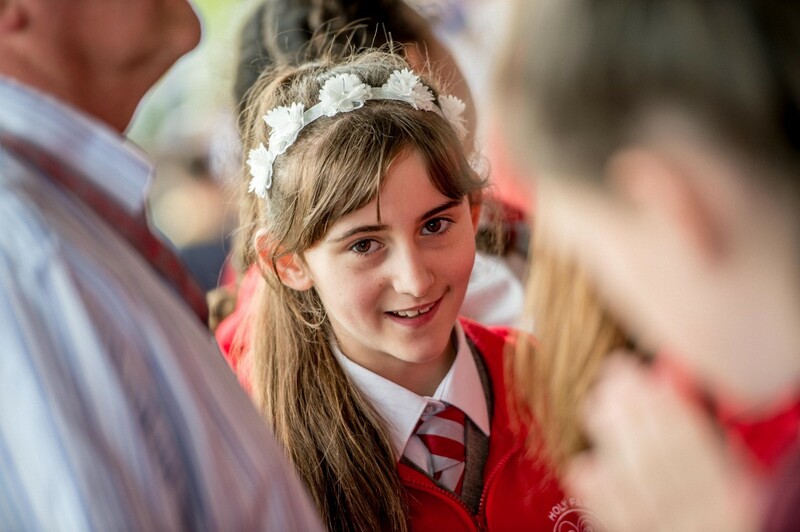 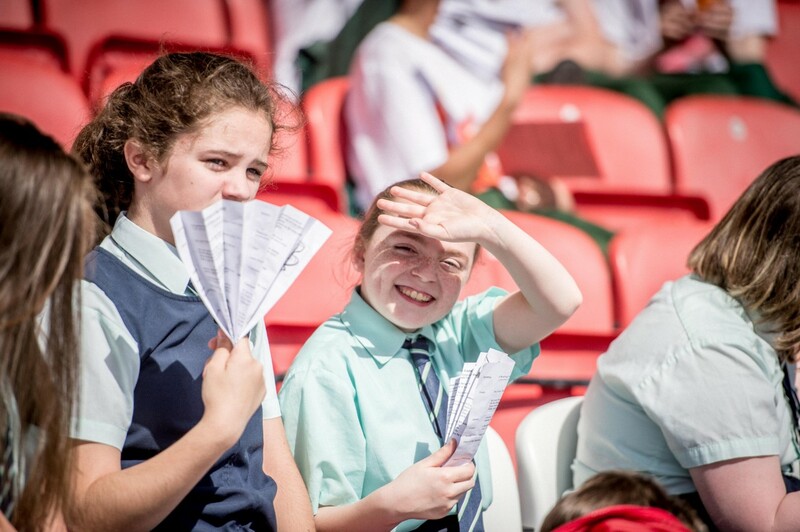 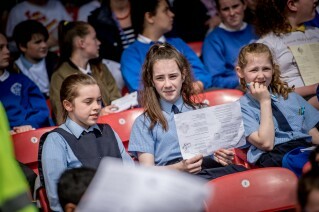 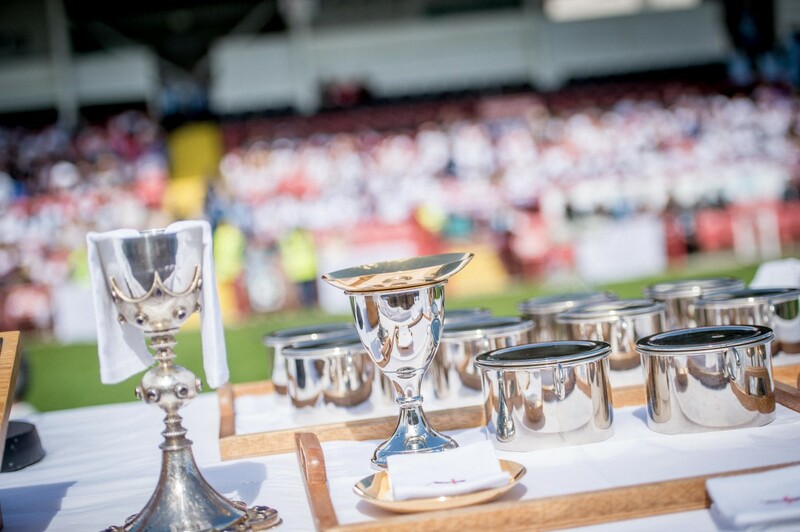 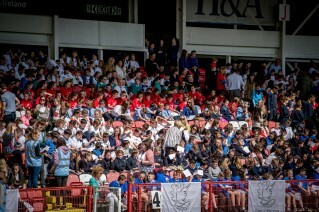 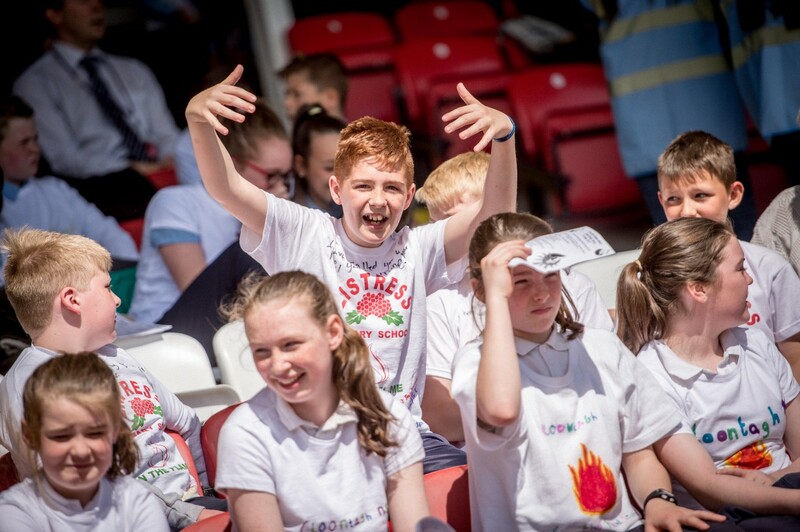 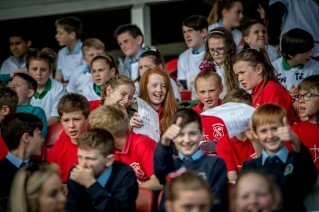 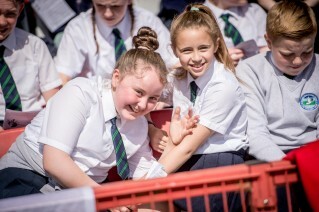 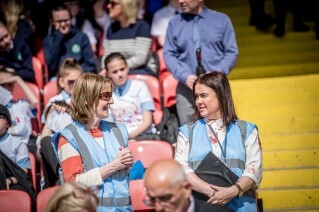 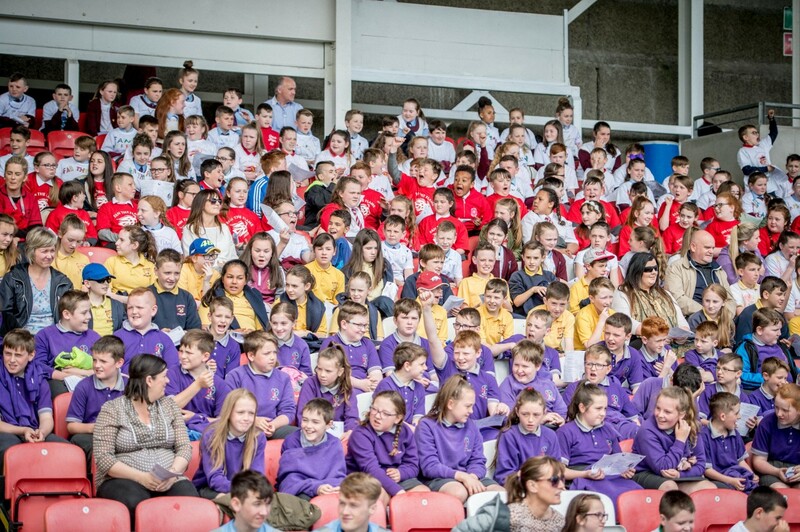 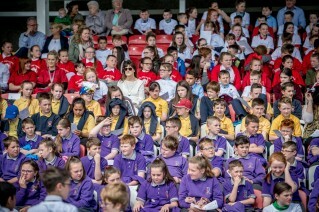 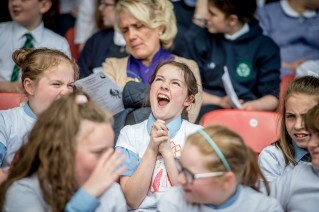 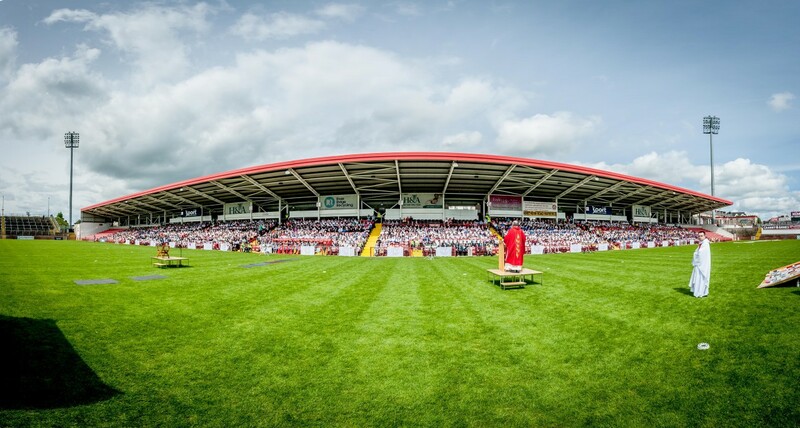 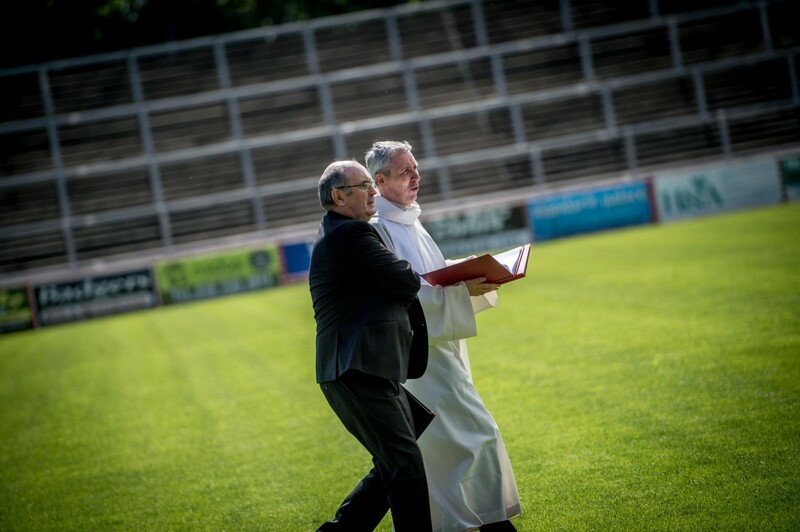 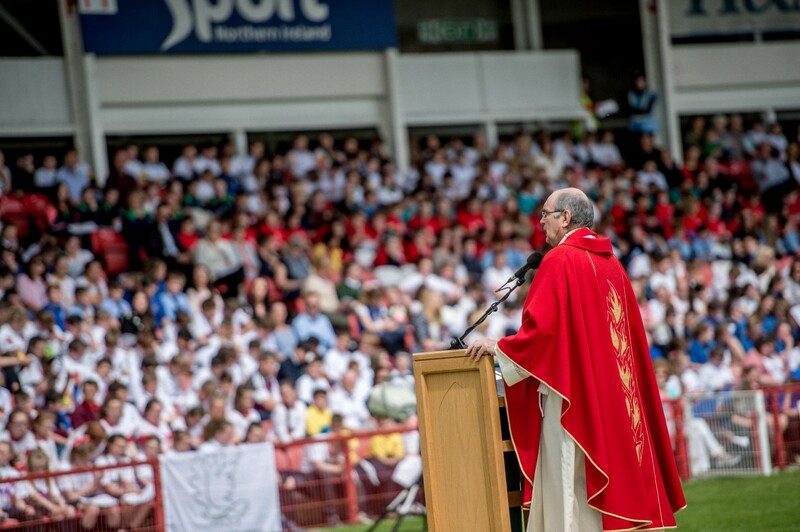 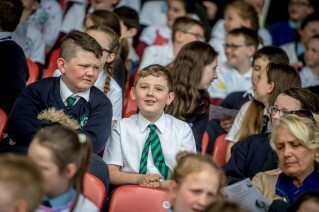 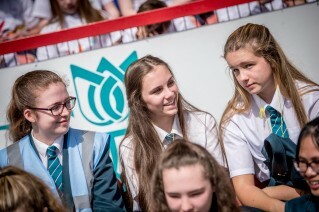 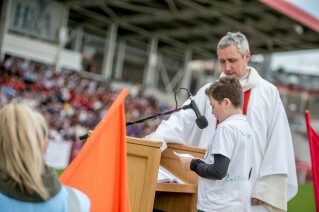 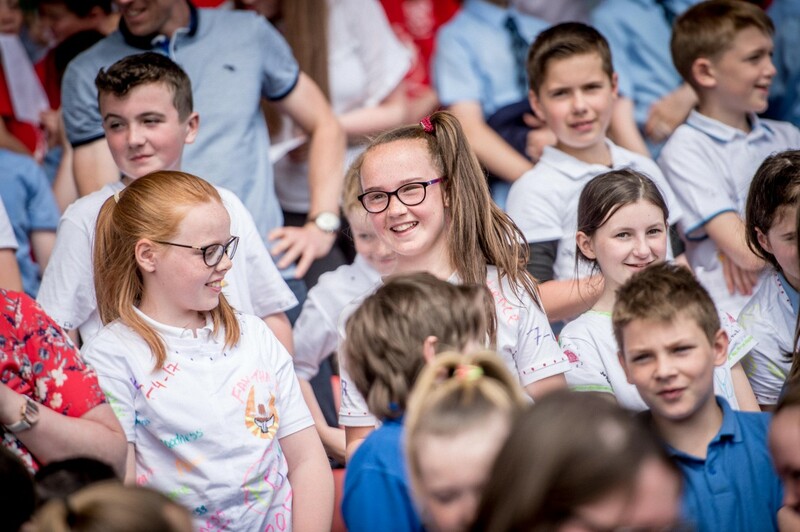 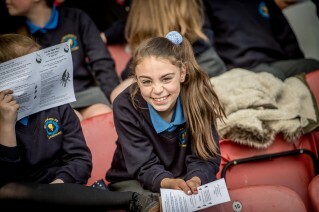 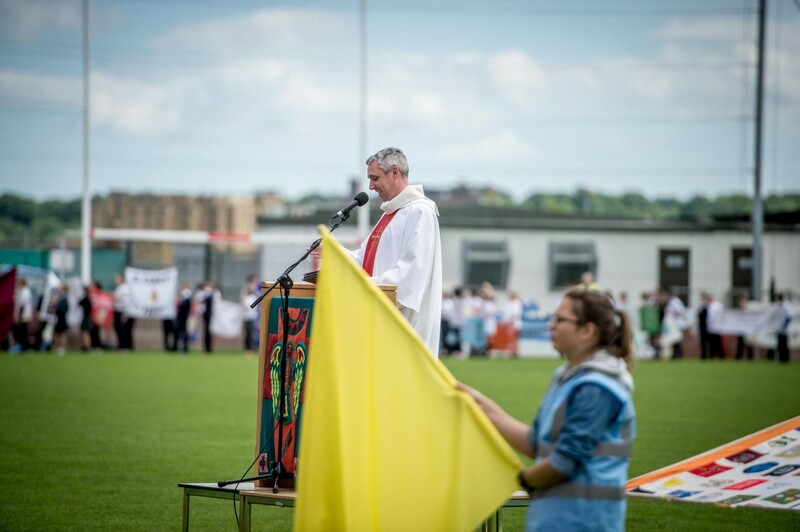 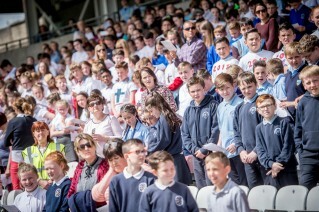 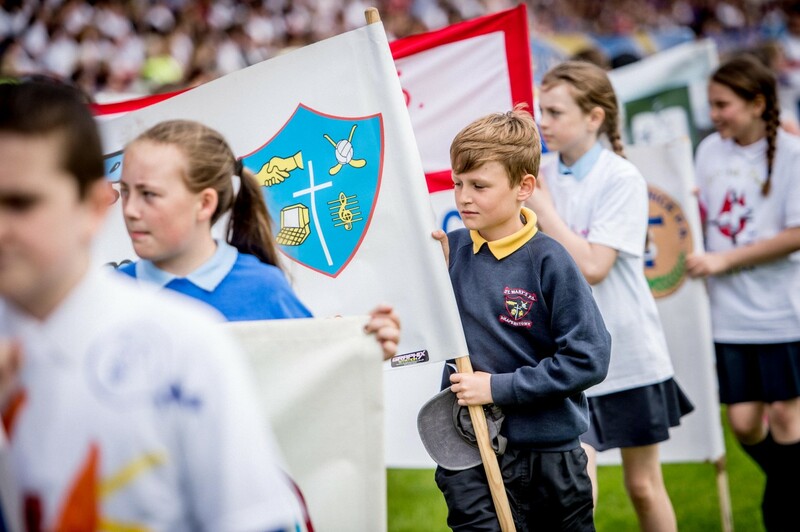 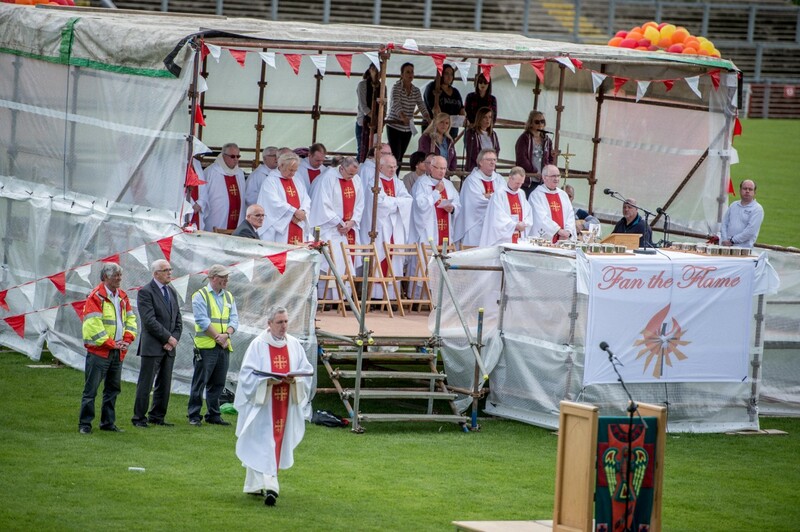 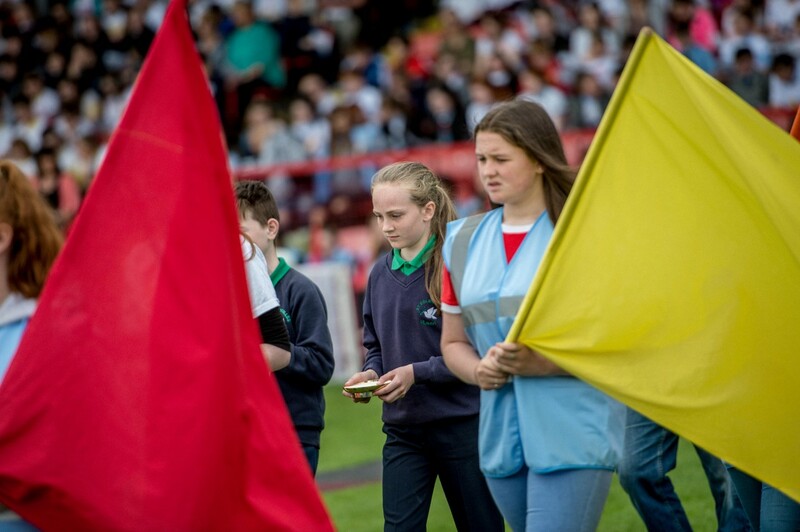 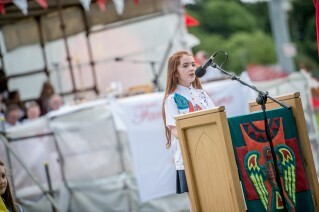 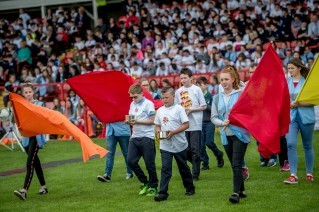 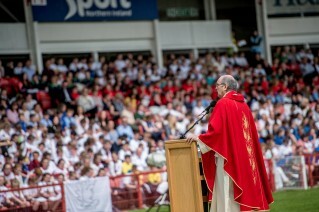 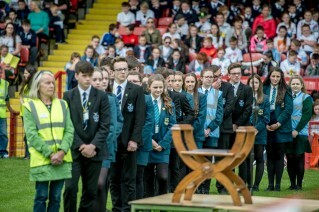 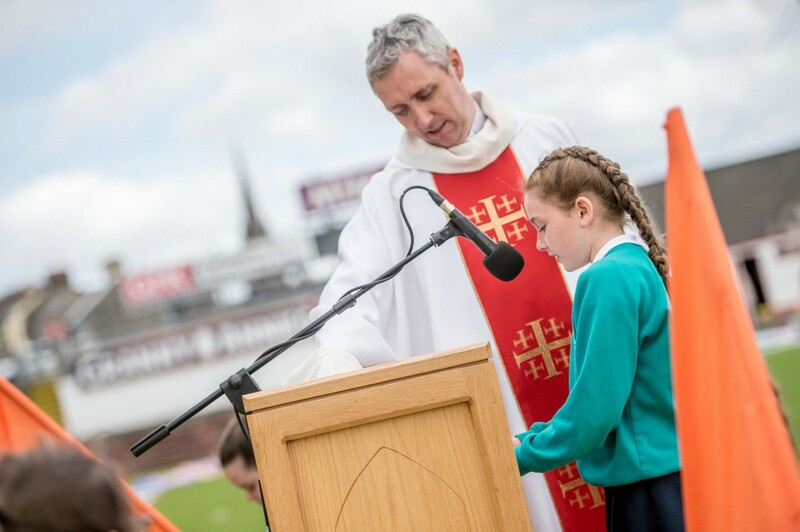 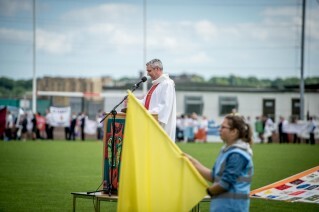 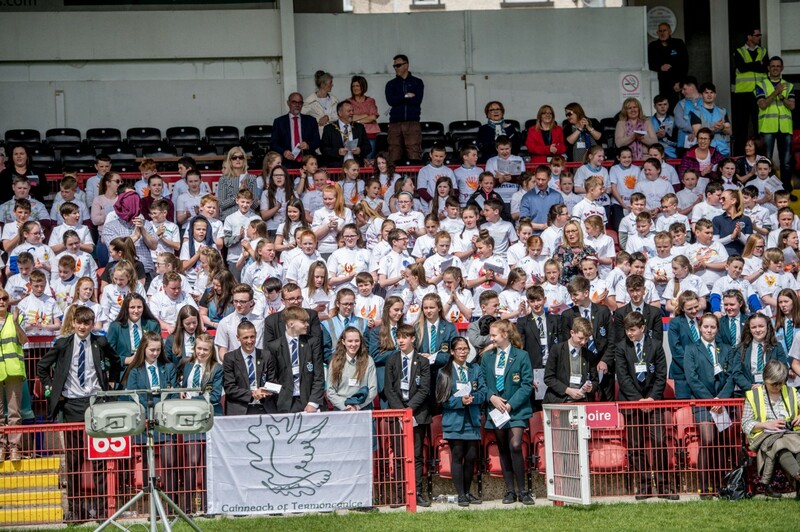 The annual Fan the Flame Mass for all the children who have received the sacrament of Confirmation in the Diocese of Derry during the past year was celebrated in Celtic Park on Wednesday 7th June. 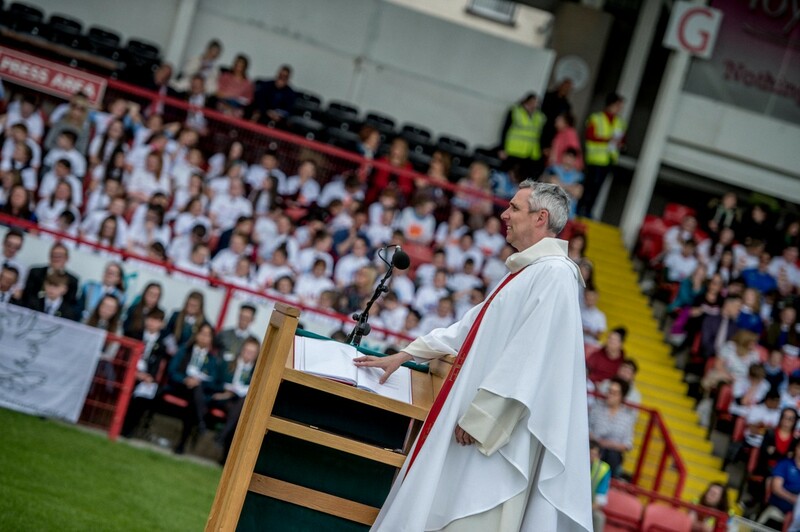 The Mass also marks the end of the primary education of these young people, an important milestone in their lives. 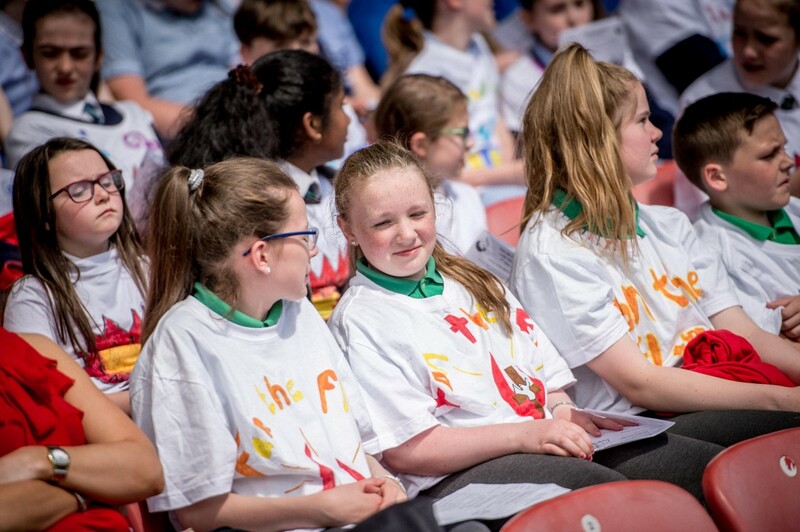 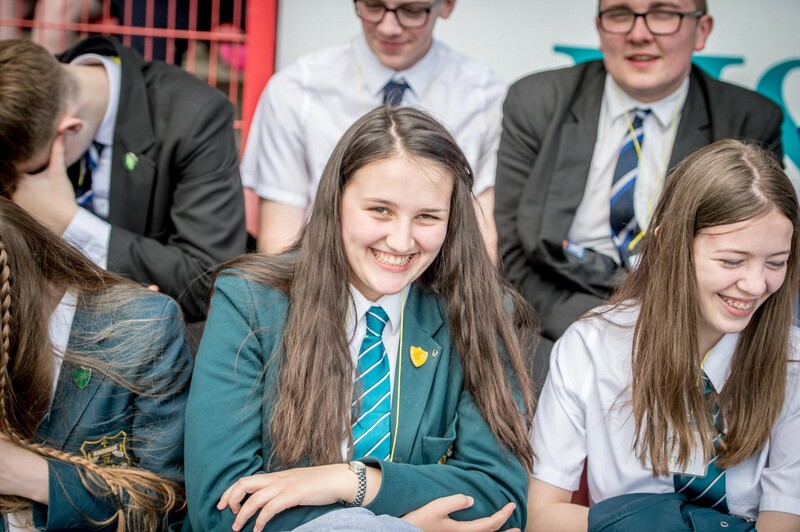 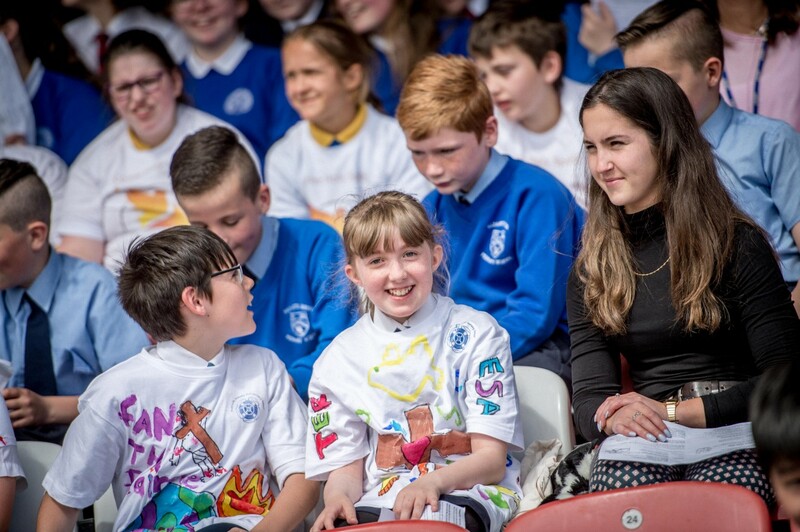 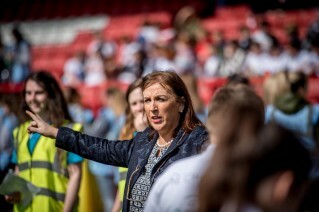 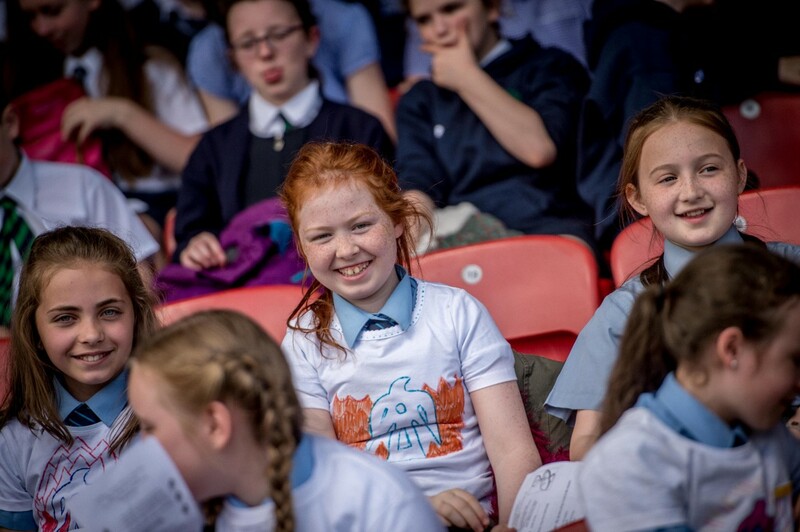 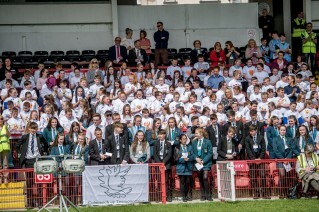 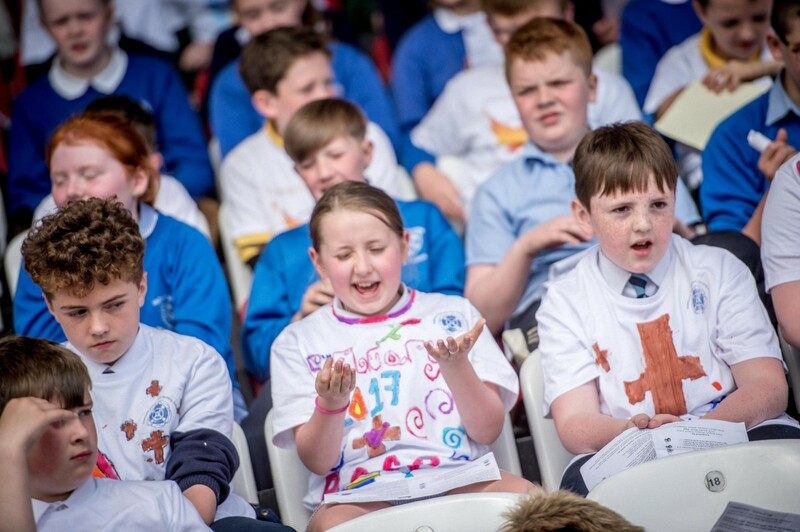 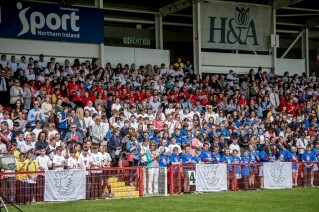 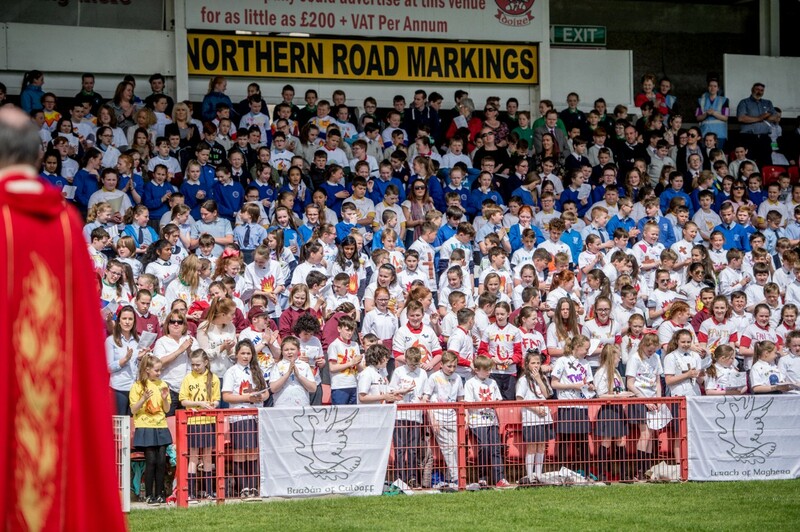 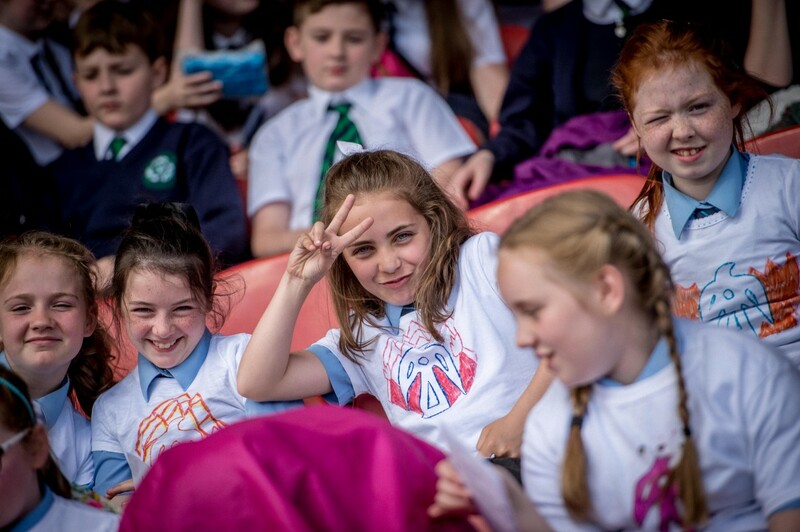 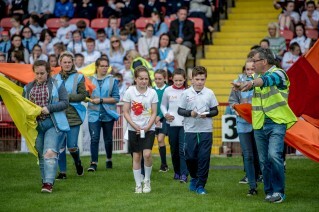 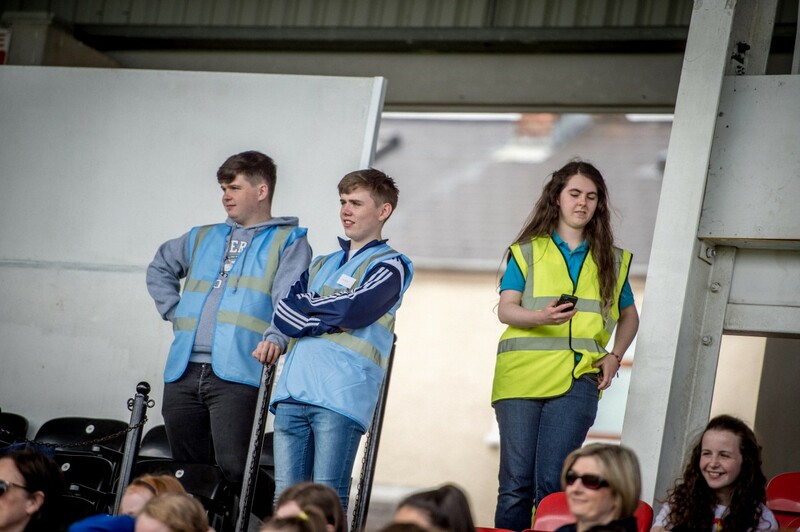 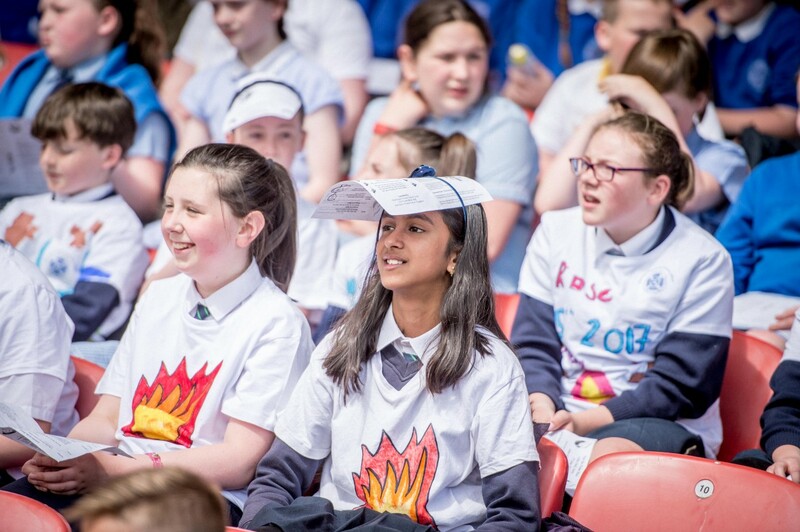 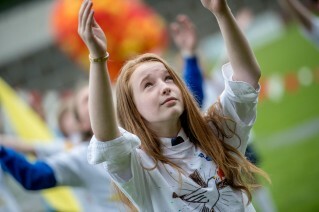 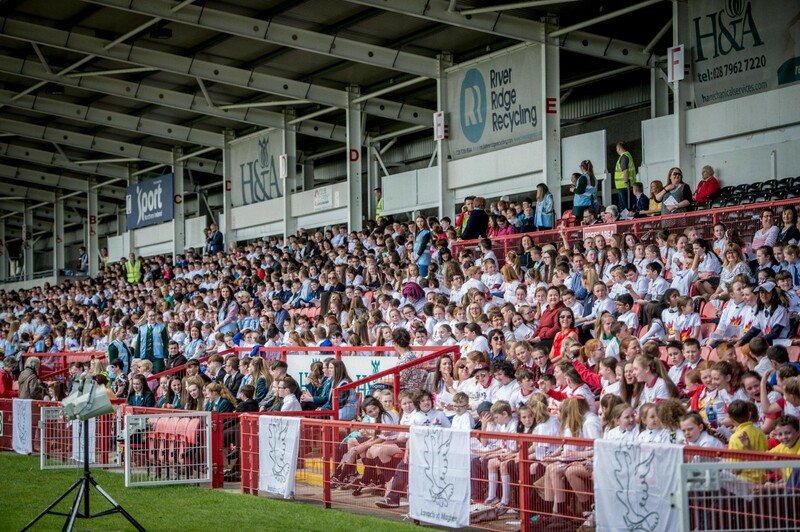 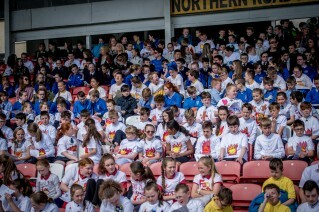 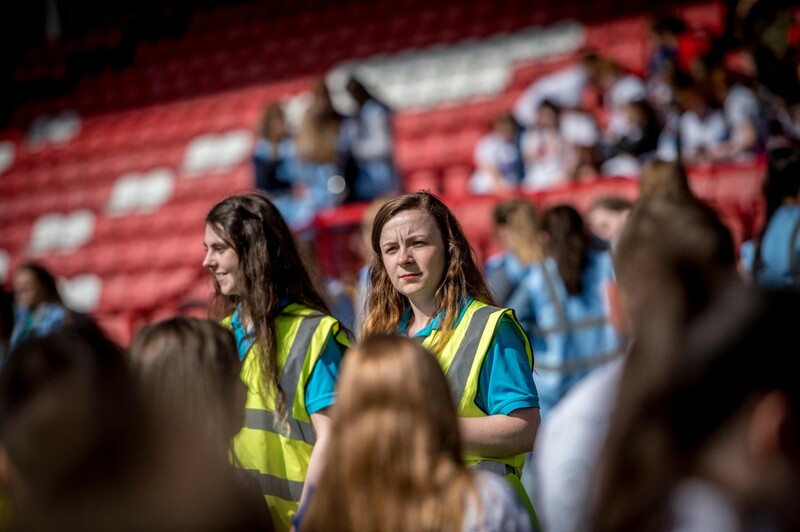 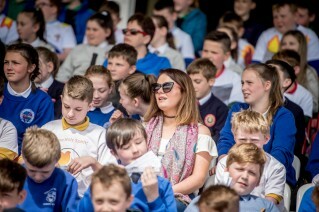 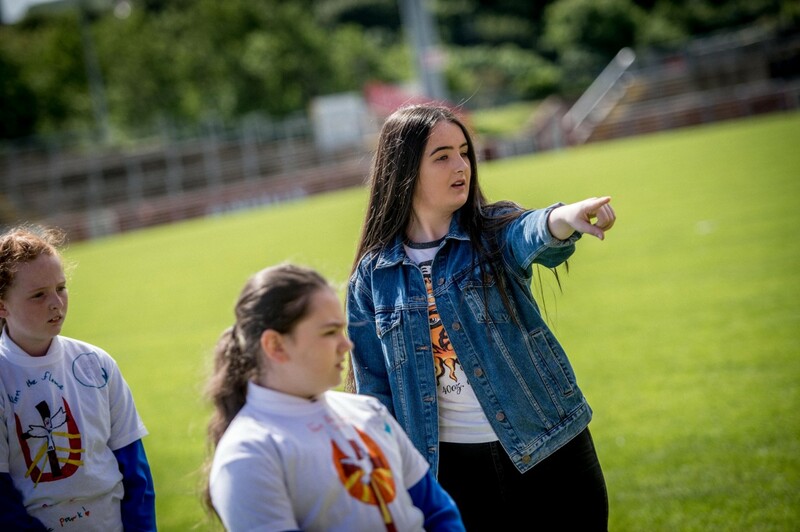 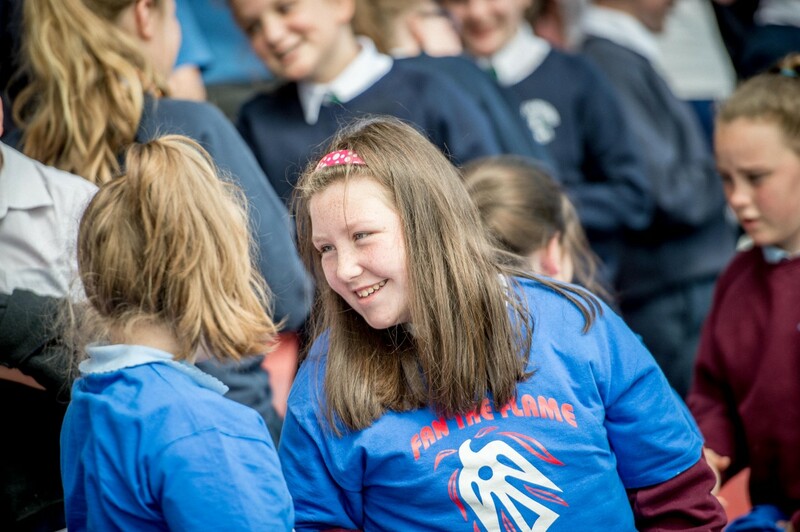 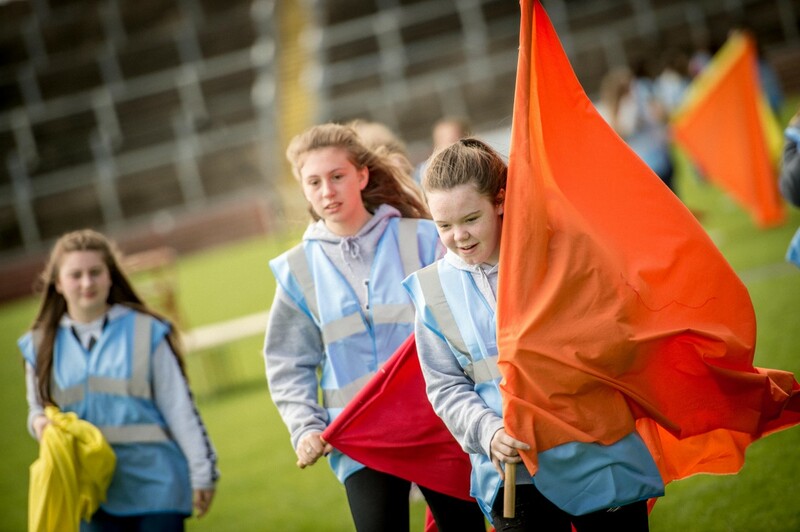 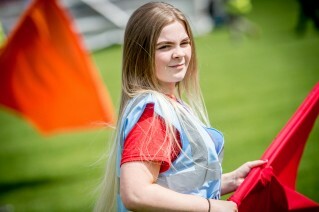 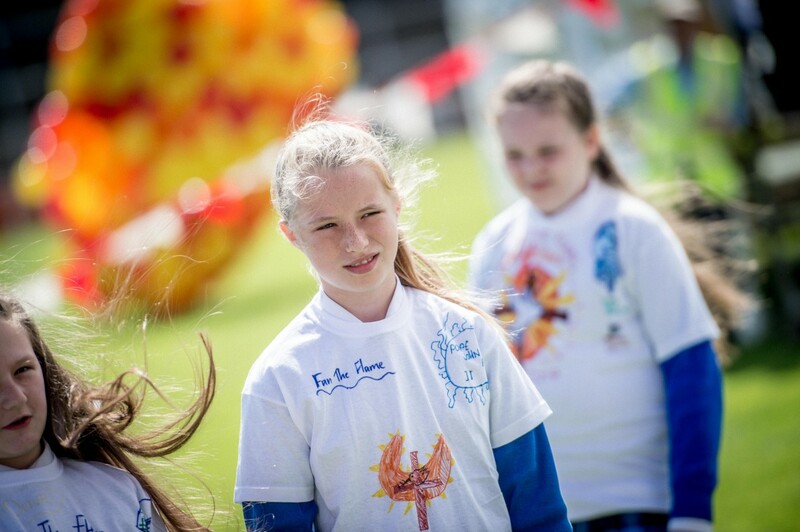 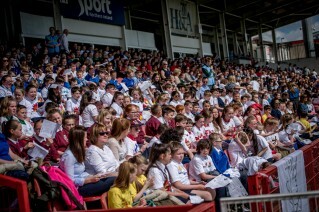 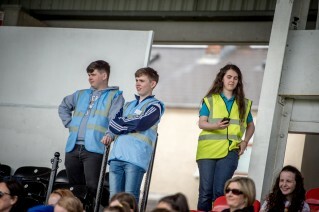 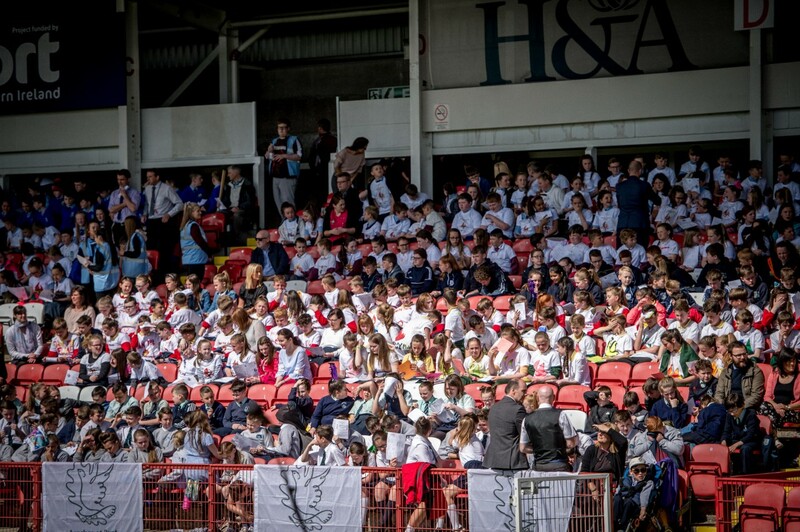 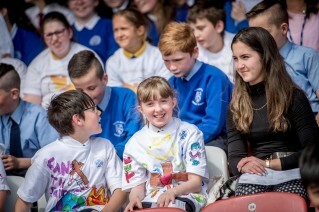 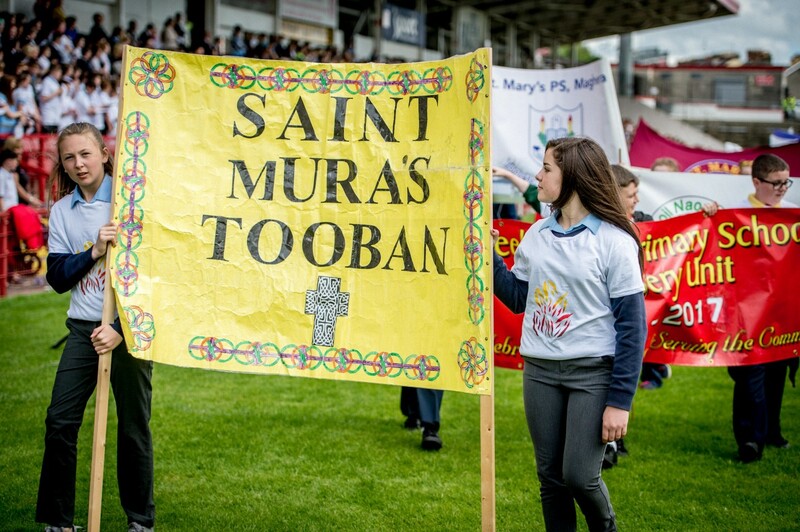 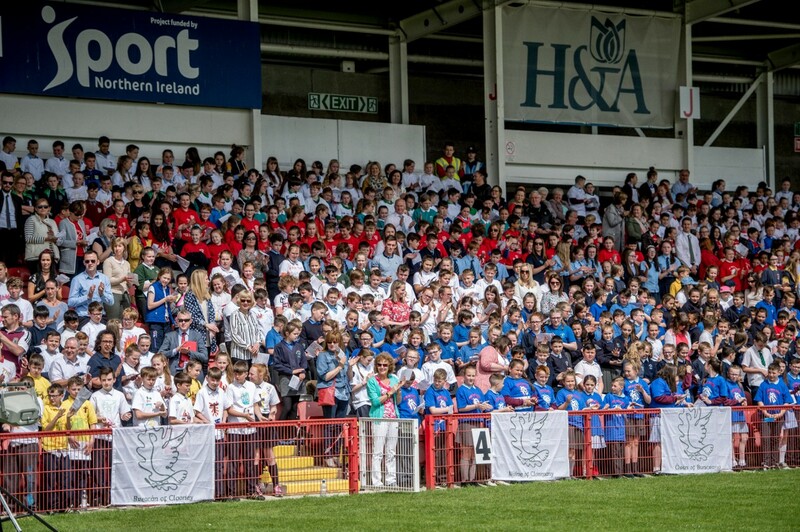 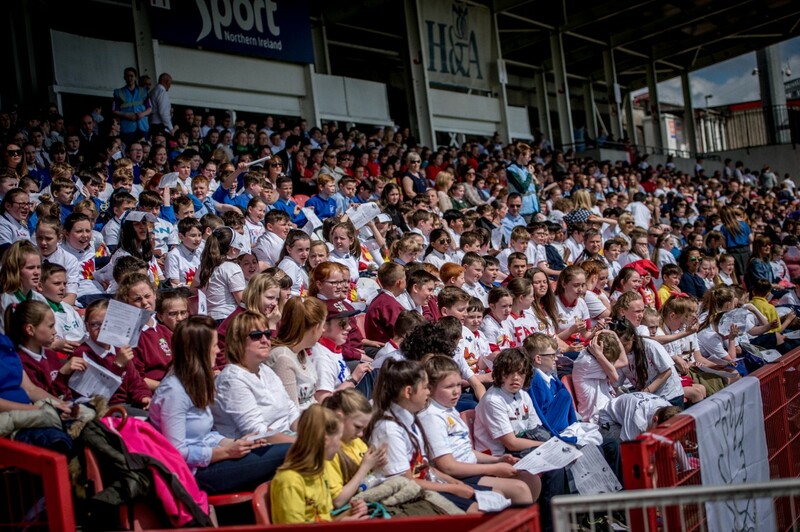 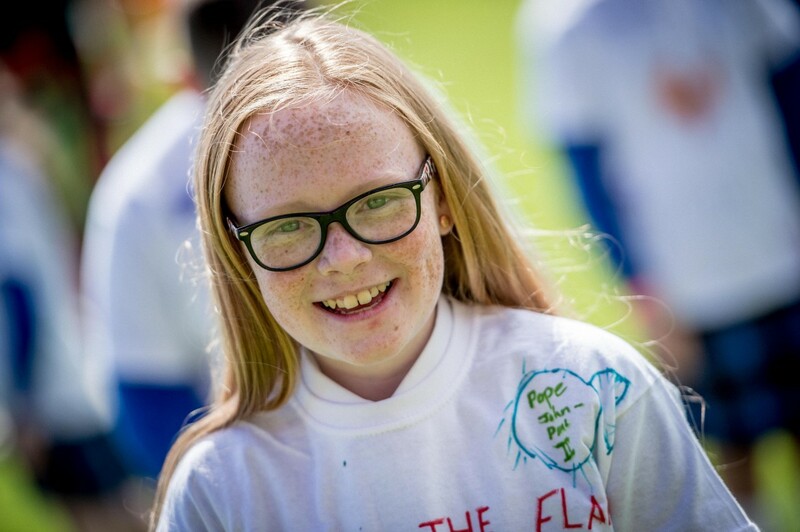 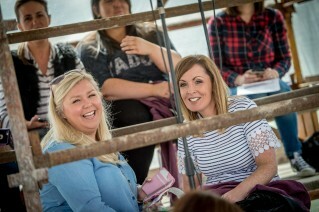 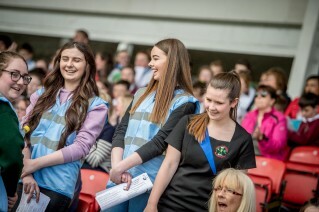 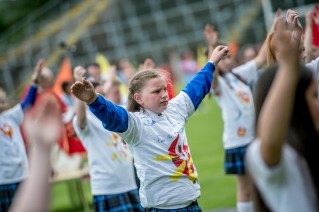 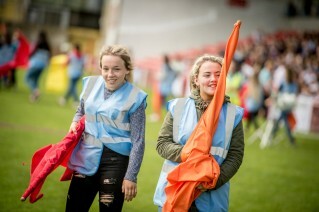 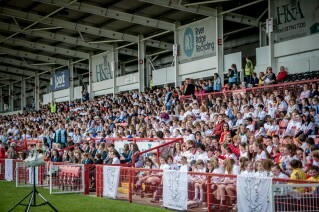 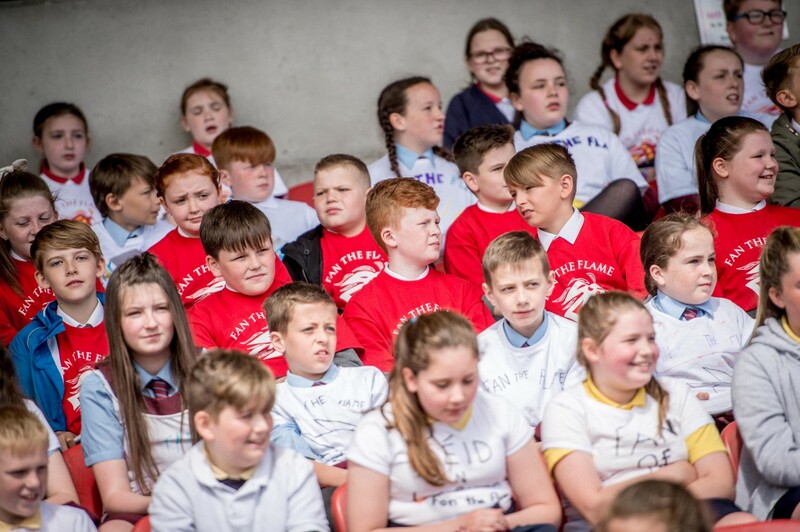 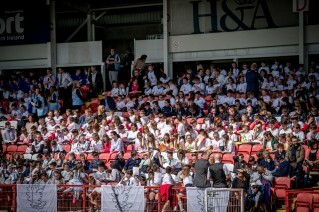 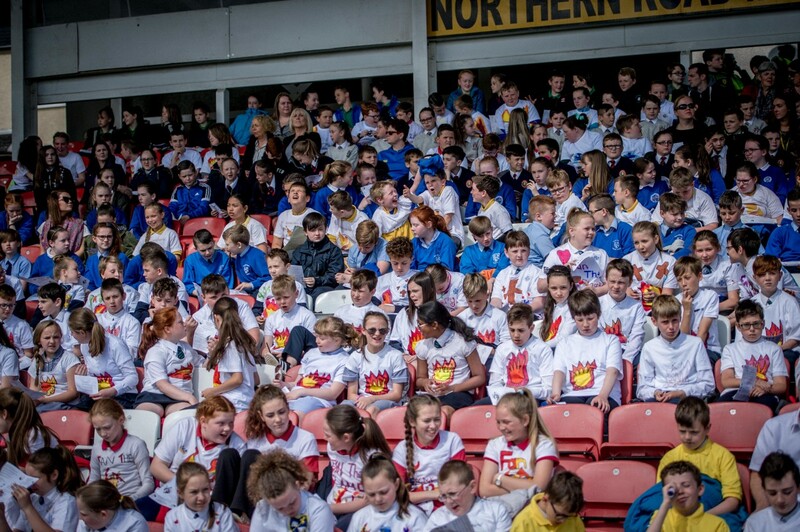 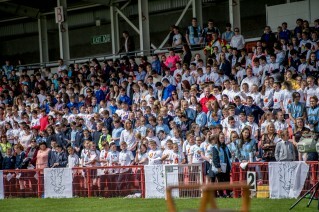 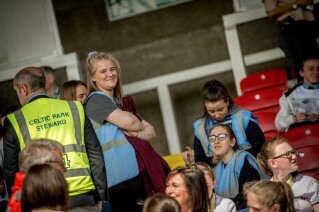 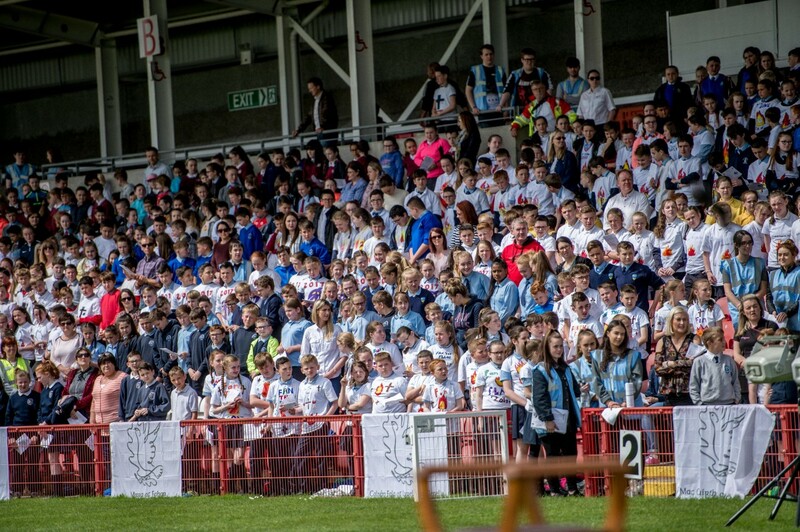 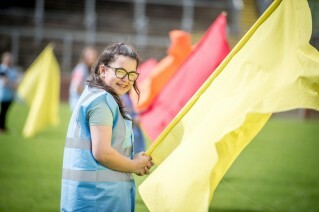 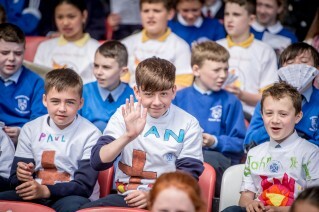 Around 2600 young people from Co. Donegal, Derry City, County Derry and County Tyrone attended, many wearing T-Shirts they had designed, reflecting the gift of the Holy Spirit in their lives. 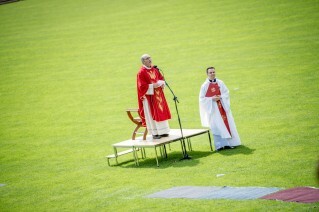 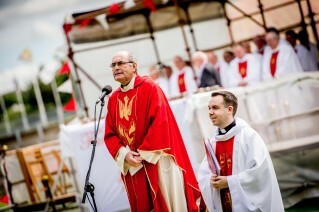 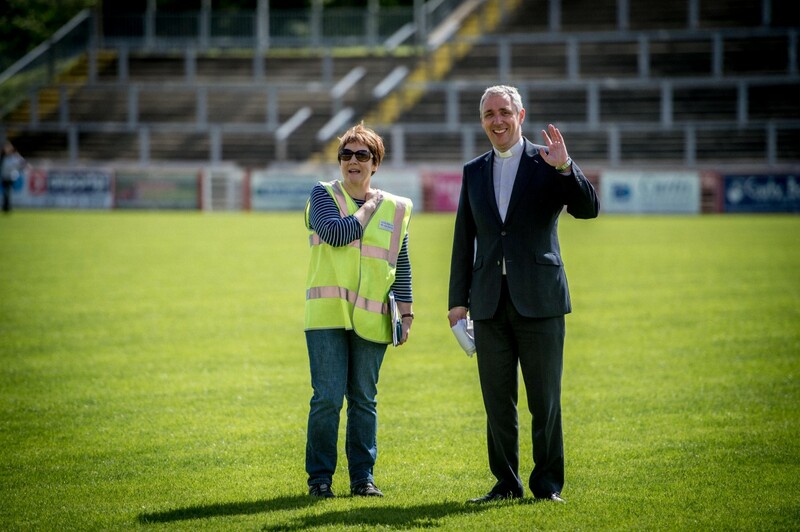 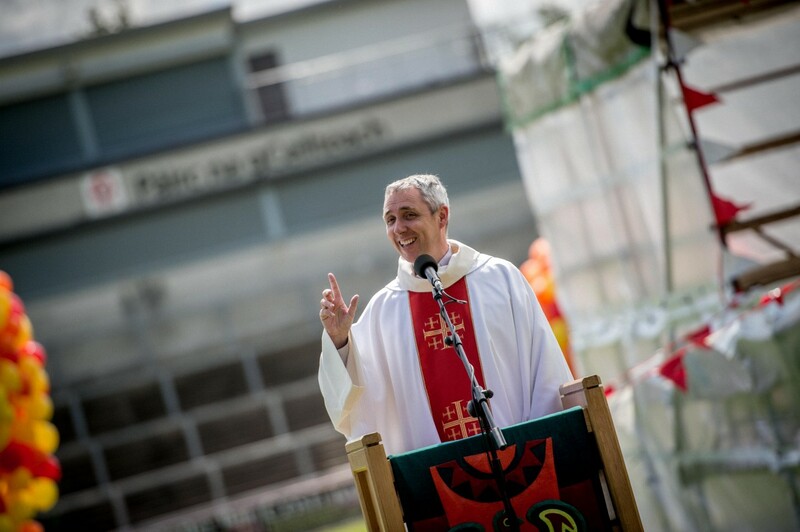 The main celebrant was Monsignor Andy Dolan, Vicar General of the Derry Diocese, and Parish Priest of Bellaghy. Monsignor Dolan, reflecting on the recent tragedy in Manchester, recalled Justin Bieber's chant at the One Love concert 'love, love. 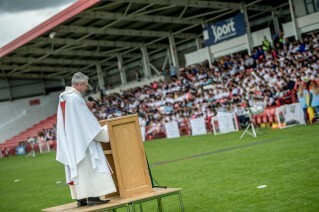 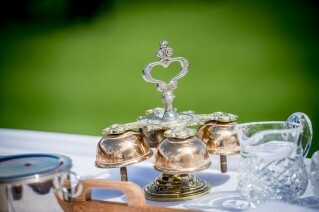 love,' He encouraged the young people to remember that the very same word, 'Love' is used by Jesus in the Gospel read at the Mass, "Love one another as I have loved you." 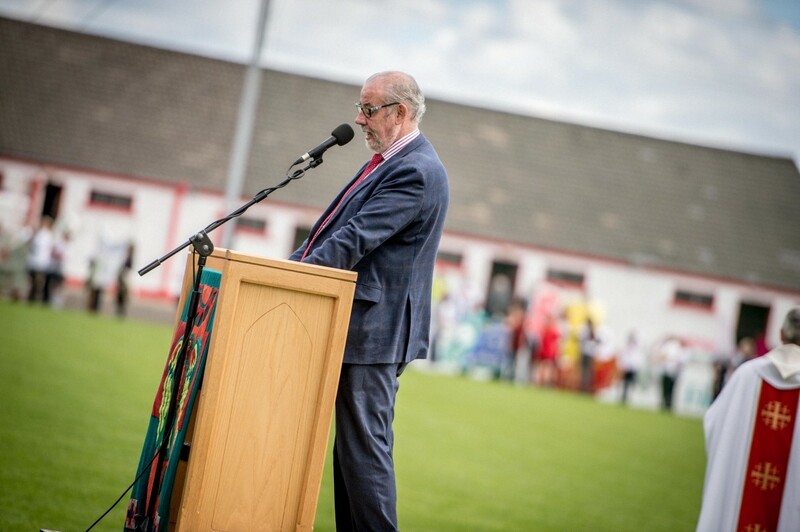 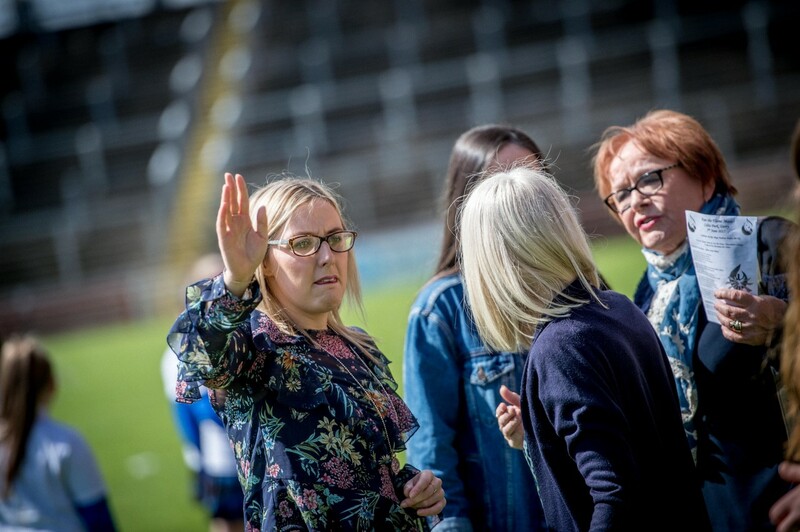 "My hope is that you can make a difference, make your world a better place in Creggan, Culmore Rd, Shantallow, Waterside, North Tyrone, South Derry, Inishowen and all places in between." Long Tower Folk Group led the music and pupils from different schools assisted in the Liturgy of the Word and the offertory Procession. 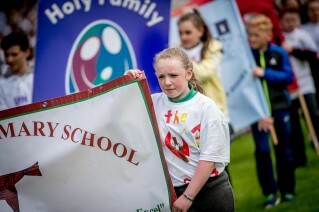 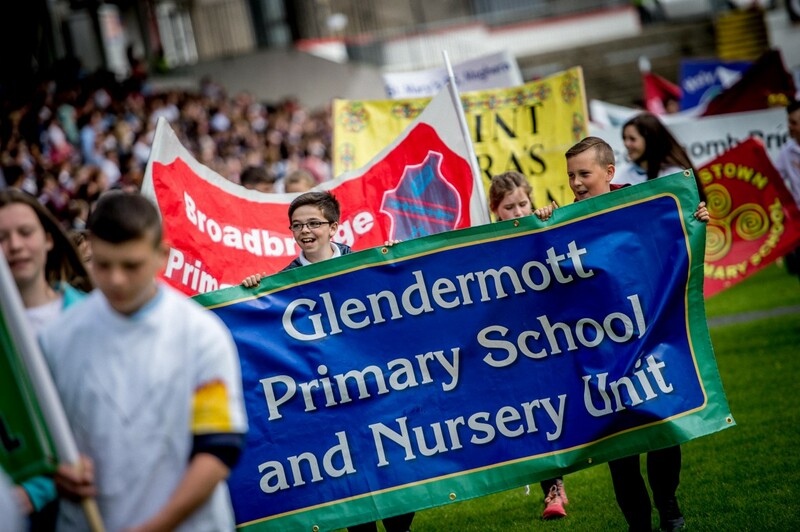 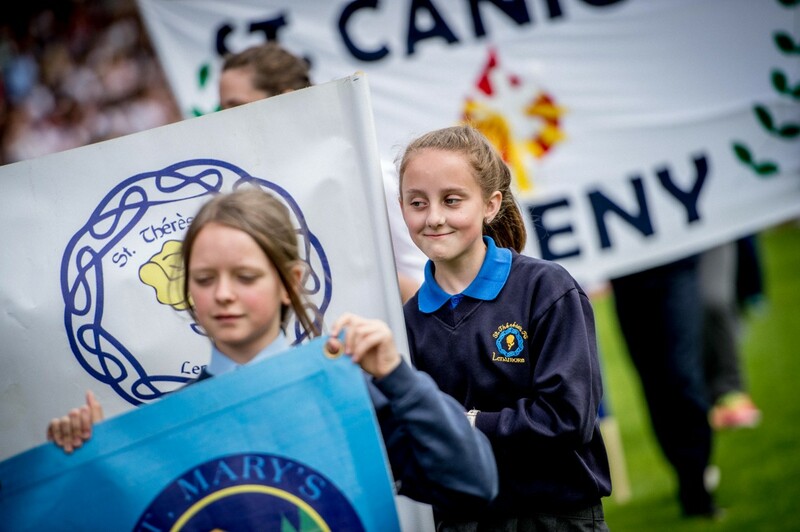 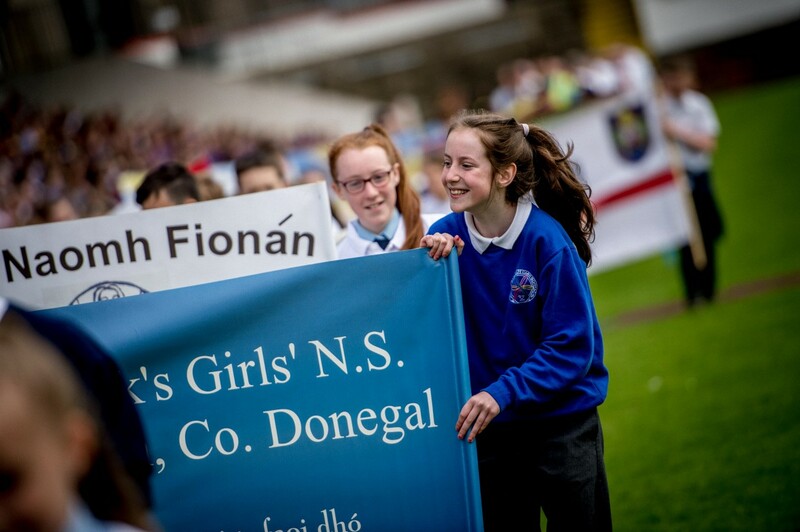 Every school brought a banner which formed part of the entrance and recessional procession. 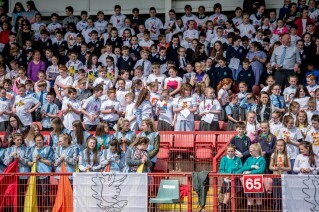 The Post Communion Reflection, led by pupils from Saint Catherine's PS, Strabane, gave everyone the chance to reflect on the fact they are each called by God and belong to God. 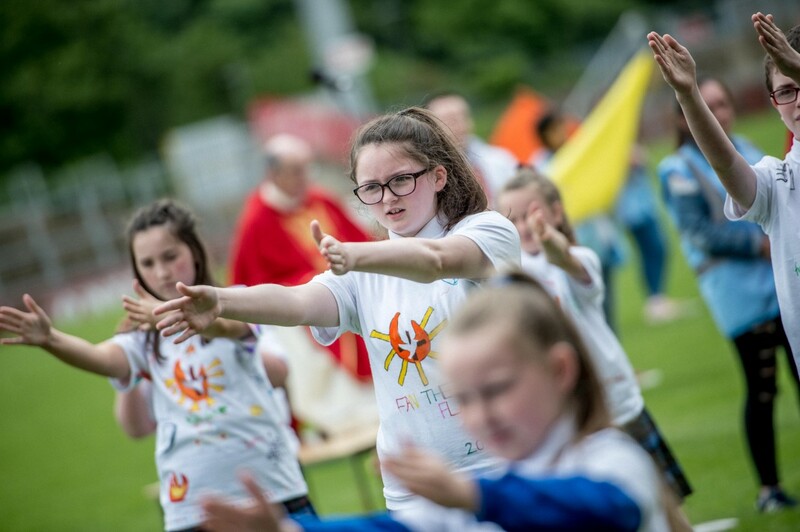 It was choreographed by Aoibhinn Kerr, a Thornhill College student, currently participating in the Pope John Paul II Award. 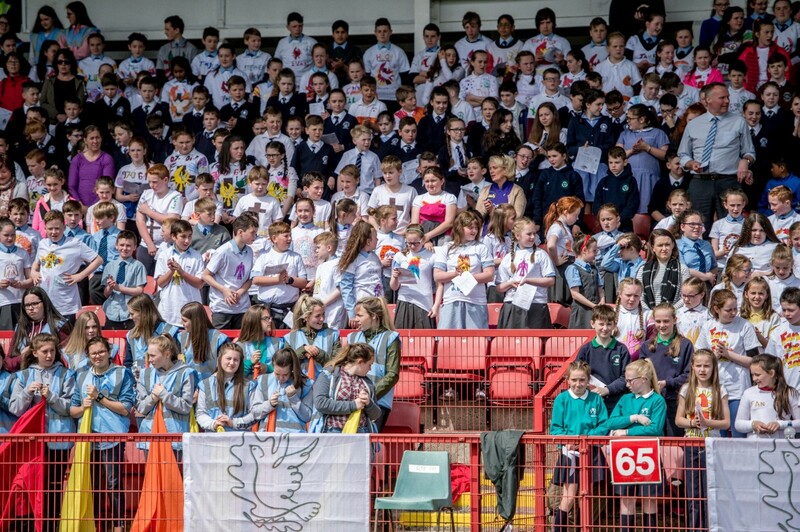 At the end of the Mass Monsignor Dolan, Monsignor Joseph Donnelly, Fr Paul McCafferty and priests of the diocese, assisted by some of the school children, released balloons symbolising the breath of the Holy Spirit living in each one of us. 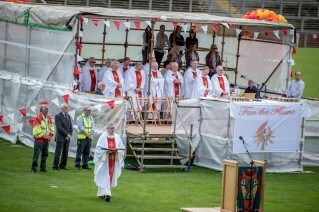 This is the 11th year the 'Fan the Flame' Mass has been celebrated. 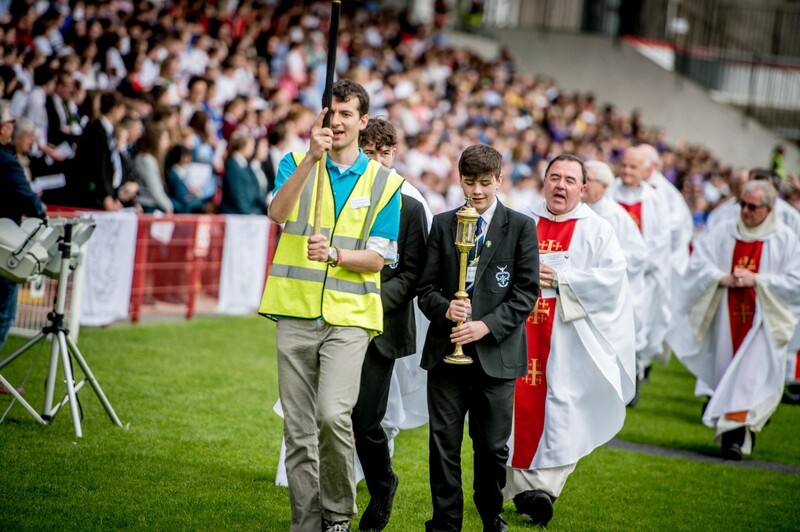 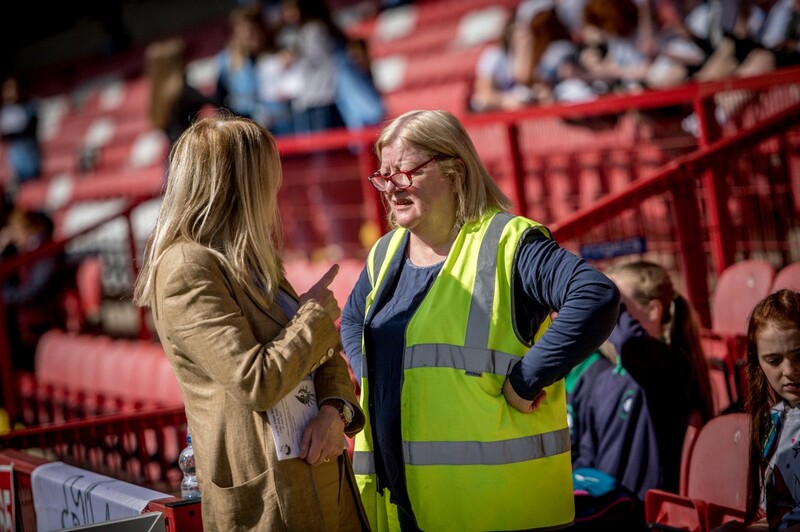 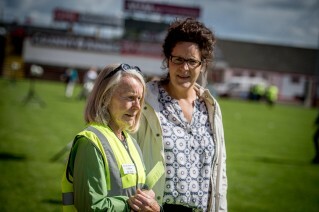 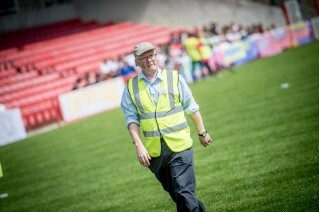 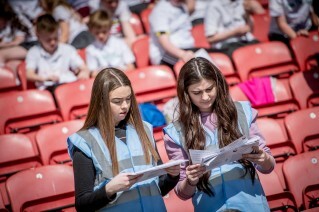 The event was made possible by the many volunteers of all ages who generously give of their time and talents to ensure that the Mass was an uplifting experience that will remain with the young people for many years. 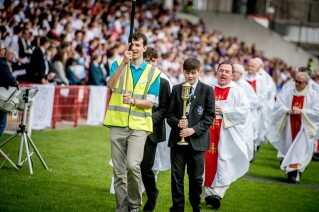 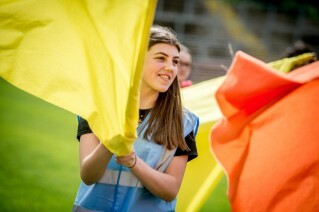 Over 100 teenage volunteers acted as Youth Ushers at the Mass. 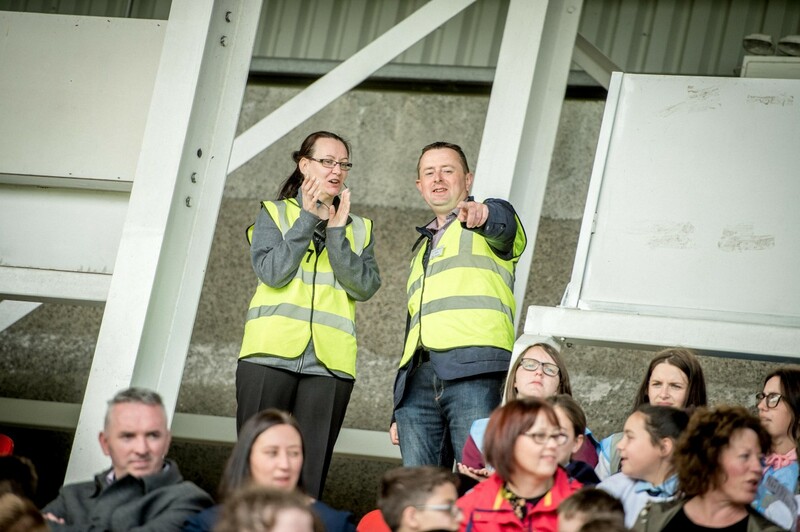 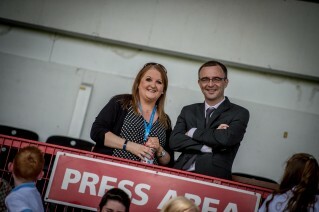 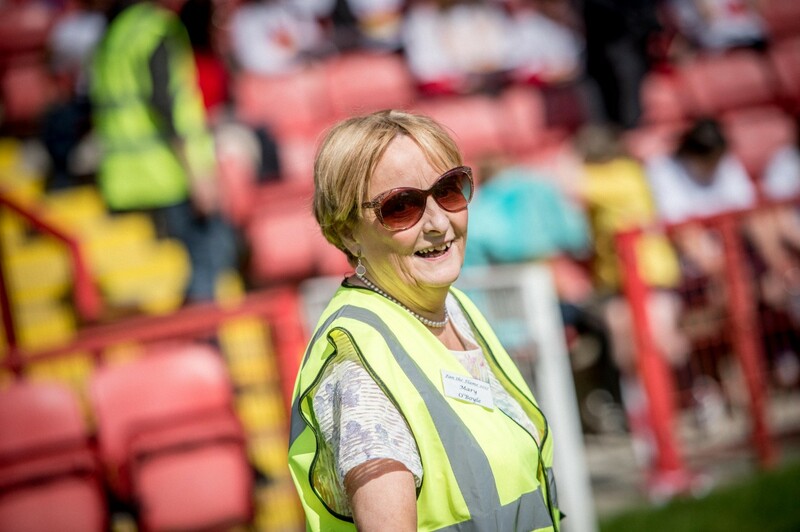 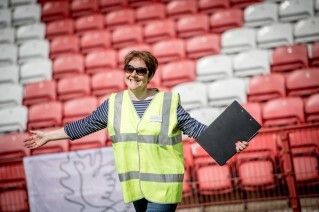 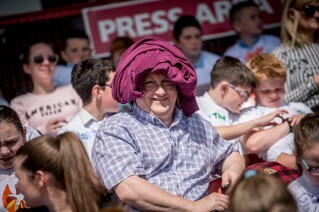 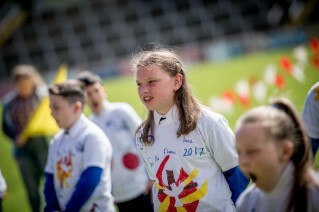 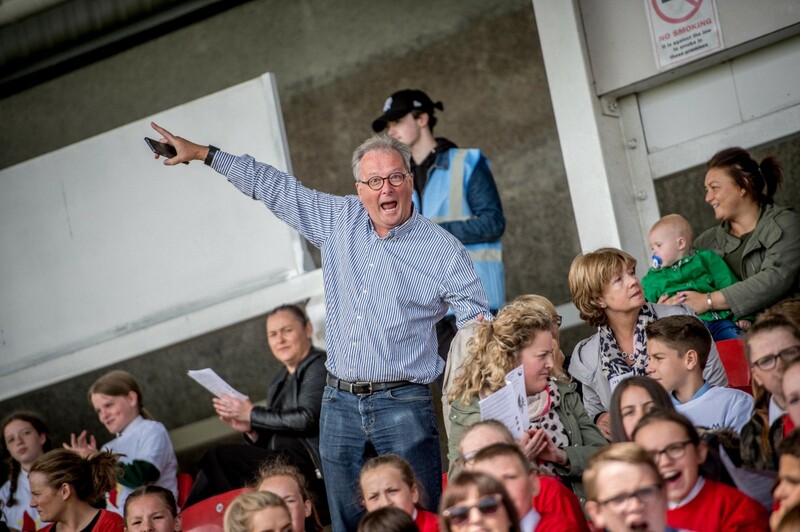 Click this button for even more photos from 'Fan the Flame Mass 2017 - Celtic Park, Derry..